I'd heard many good things about this book and was looking forward to reading it. There were lots of things about it that I liked. 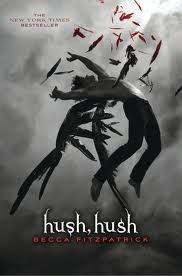 I enjoyed the mythology behind the fallen angels and the new twist on the familiar theme. The pacing was pretty good and the storyline held my interest throughout, making it a hard book to put down. I liked Nora's character too and she came across well. You're waiting for the 'but', I'm sure, and yes, there is one. Patch. I really wanted to like Patch as I do tend to prefer the 'bad boy' heroes on the whole, but I just felt something was lacking. Maybe I've been hearing so much about how fantastic he is from other readers that I was expecting too much, but I did find him a letdown. Sure he brooded, acted badly and was mysterious, and from that point of view I could understand Nora's attraction to him. But he just never seemed fully formed to me. In my mind he was more of a two dimensional shadow than a fully-fledged character. I just couldn't 'see' him. That is why this book gets four stars instead of five. That hasn't put me off reading on though, and I am keen to get hold of the second book to see if his character improves, given the change of circumstances he finds himself in at the end of this first book. As I said, I enjoyed the mythology and am keen to see where Fitzpatrick takes that in the sequel. Oh, and I love the cover art! I'm glad you enjoyed the book! I know what you mean about Patch, it took me awhile to warm up to him. Great review!